Once called the Tappan Zee Bridge, the three-mile Mario Cuomo span over the Hudson River took 15 years of planning and construction, cost $7 billion with finance charges and interest, but lacks one essential element – public transit buses running at high speed. Meanwhile, in the land of poppies and pandas, the world’s longest connector, the Hong Kong-Zhuhai-Macao Bridge, opened November 6. Public transit buses began cutting commuter time from four hours to just 30 minutes on its 34-mile span across China’s Pearl River estuary. China’s new world’s longest bridge and tunnel system cost one-fourth of Cuomo’s suspension structure per mile, once again demonstrating the inefficiency of American corrupt infrastructure repair and replace. The result here has been little effort to improve our highways and bridges, install public transit or even ensure safety of our citizens. There are 612,677 bridges in the United States. Of them, 54,259 are “structurally deficient,” which means they have at least one key structural element in poor condition. That’s almost 9% of all US bridges, and the figure includes the famous Arlington Memorial Bridge and the Brooklyn Bridge. 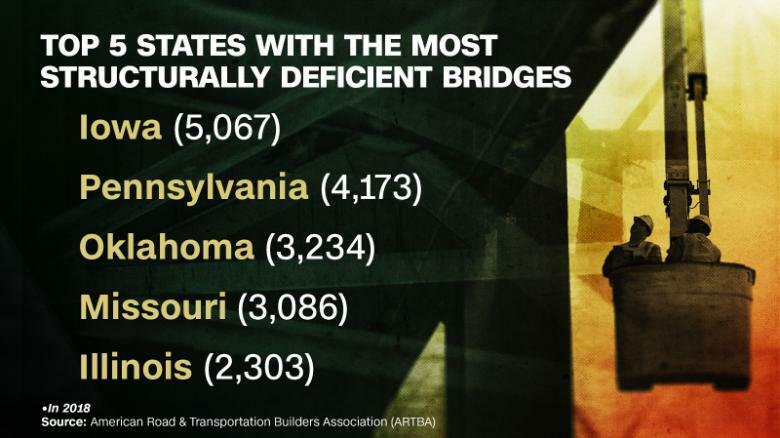 Americans cross these structurally deficient bridges 174 million times each day. Why does it cost so much to build here, resulting in little repair or replace? Spain, a developed market democracy, gets 10 to 20 times as much infrastructure for its money as America does, and it is of much higher quality to boot. The fact that both left- and right-aligned institutions (public employee unions and private contractors, respectively) are implicated here is evidence that this isn’t a typical left-right situation. And if we look internationally, both Singapore (very free-market) and Sweden (socialist) manage much cheaper building costs than America. 34 miles in 30 minutes! The hidden infrastructure costs include payoffs to office holders, a practice I reported as far back as the mid-60s. Individual “considerations” could reach millions in today’s dollars for approving contractors for local roads, allowing zoning changes or issuing permits. Many a poor fella became rich after a few years in borough or township office, even though stated salaries were very low. Imagine today’s possible immense payoffs to state officials, governors and those lobbyist-appreciated creatures in Congress? China has corruption under control, and rather than fining “white-collar” criminals, it has them executed rather often for kickbacks and bribery. Their new bridge is 20 times the length of San Francisco’s Golden Gate Bridge, according to The Wall Street Journal, and the six-lane highway links up a region with a population of about 70 million. Since ships use the waterway, there’s a four-mile middle section, where the bridge changes to an undersea tunnel that links a pair of artificial islands. There’s no rail link – only private shuttle buses. Car owners must have separate permits for each city, which are subject to a quota, and pay a toll. The bridge has “yawn cameras” that alert authorities if bus drivers seem sleepy — three yawns and they must explain themselves, France 24 reported. Oddly, cars in Hong Kong and Macau drive on the left and mainland Chinese drivers stay on the right, so there’s a merge point where they switch sides.